Get your finalized Decree by mail. At least one of the spouses must live Pennsylvania for six months before filing for divorce. You can get a divorce by mutual consent in Pennsylvania, if you and your spouse agree that the marriage is irretrievably broken. This just means that the marriage cannot be fixed. File initial divorce forms at the Court Clerk's office. Mail divorce papers to spouse. Sign and file the consent and waiver forms. Receive your Decree in the mail. Division of property, child parenting plan (including child support, visitation and custody), alimony, and more are covered. If your documents are not accepted by the Court, DivorceWriter offers a money back guarantee. 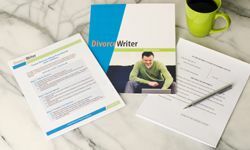 You have qualified to use DivorceWriter to complete your Pennsylvania divorce papers online. Select "Continue" to start the interview.